We shall go with thee! Where the French are so French! "... The positions of Mons. Williamson on the Shoah are absolutely unacceptable and firmly rejected by the Holy Father, as he himself remarked on the past January 28, when, referring to that brutal genocide, reaffirmed his full and unquestionable solidarity with our Brethren receivers of the First Covenant, and affirmed that the memory of that terrible genocide must lead "mankind to reflect on the unpredictable power of evil when it conquers the heart of man", adding that the Shoah remains "for all a warning against forgetfulness, against denial or reductionism, because the violence against a single human being is violence against all". Bishop Williamson, for an admission to episcopal functions in the Church, will also have to declare, in an absolutely unequivocal and public manner, distance from his positions regarding the Shoah, unknown to the Holy Father in the moment of the remission of the excommunication. ..."
Pope Benedict XVI speak for us all. The victims of this unspeakable and previously unimaginable crime amounted to 11,000 named individuals in Cologne alone; the real figure was surely much higher. The holiness of God was no longer recognized, and consequently, contempt was shown for the sacredness of human life. in the gas chambers and ovens. ..."
"... All Christians must feel committed to bearing this witness in order to prevent humanity of the third millennium from once again experiencing horrors similar to those tragically called to mind by the extermination camp of Auschwitz-Birkenau. It was precisely in that place, sadly famous throughout the world, that I chose to stop before returning to Rome. Hitler had more than 6 million Jews exterminated in the camp of Auschwitz-Birkenau and in other similar camps. About 150,000 Poles and tens of thousands of men and women of other nationalities died at Auschwitz-Birkenau. In the face of the horror of Auschwitz there is no other response than the Cross of Christ: Love descended to the very depths of the abyss of evil to save man in his core, where human freedom can rebel against God. May contemporary humanity never forget Auschwitz or the other "death factories" where the Nazi regime attempted to eliminate God in order to replace him! May it not succumb to the temptation of racial hatred which is at the root of the worst forms of anti-Semitism! May people recognize once again that God is the Father of all and calls us all, in Christ, to build a world of justice, truth and peace together! ..."
He is in my prayers always, but most especially now. He is not alone. 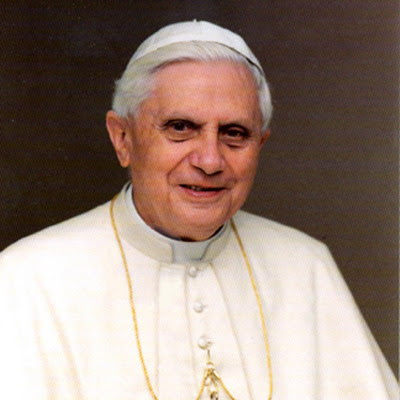 God bless our Holy Father! THANK YOU FOR ASSEMLING THIS PROOF. IT IS INVALUABLE. tHOSE WHO HAVE EARS TO HEAR HAVE HEARD, IT IS THE SECULAR MEDIA THAT NEEDS TO BE CHALLENGED. tO SEND THIS OUT AS A PRESS RELEASE WOULD BE ABSOLUTELY THE THING. THEY HAVE DELIBERATLY IGNORED THESE THINGS. WILL BE BACK AFTER SUPPER AND A TE DEUM. GOD BLESS AND PRESERVE YOU ALL. ANGELA MERKEL ... ARE YOU LISTENING??? Fr. Georg Ratzinger has it right ... the liberal politicians and pundits are irrational. <"... it is the secular media that needs to be challenged ">. The few care with which the media deal with the Church Things is really deplorable. Bad information generates confusion among common people and provides a starting point to any kind of provocateur. That said, now I am looking forward to clearly hear Bishop Williamson next public declaration regarding the Shoah. Rev. Father, I am near to you all in these difficult times. I am not referring here to anyone, however, there are people who do not believe in Holocaust, they deny authenticity of concentration etc. I came from the country where several concentration camps has been built during the WW2. The witnesses who lived in nearby areas are still alive and can testify. I do not know exact numbers, but I have always heard the majority of victims were Jews or half Jews, ethnic minorities, like Gypsies, disabled people, prisoners of war including Russians and native citizens of my country, including those who actually helped the Jews to survive and were caught. One must remember the penalty for such a crime was death, and despite of these many people risked their lives to help, in particular children who lost their parents. The Jews had to live in ghettos - special isolated area in the cities and they were really wearing. the ghettos could be found in every European city under German's occupations. I don't agree with Bishop Williamson and I don't understand why he's trying to do a recount of those Jews that died. (Aren't there more important things to worry about?!) But I still don't think that his opinion is a crime. Nor do I think we Catholics should be cringing ~ as if somehow Bishop Williamson is commiting a Catholic crime and we're all guilty by association. It's bad enough we individual Catholics are still being made to answer for the Crusades and the Inquisition and the Priest scandals ~ now we are expected to answer for Bishop Williamson too! Enough already. I'm tired of the world expecting us to grovel in apology about everything just because we're Catholics. As for never forgetting the Holocaust with the goal of it never being repeated... it's already been repeated! Over and over! "...in order to prevent humanity of the third millennium from once again experiencing horrors similar to those..." This comment is 100% true but totally out of touch because the Jewish Holocaust was neither the first or, sadly, the last. All of our monuments, all of our memorials, all of our "don't forget the Holocaust" hasn't done much good at all! We keep looking back at one Holocaust while holocaust takes place all around us. Hello! I am neither "anti-Jew" nor a Holocaust denier ~ but I'm deffinately realistic. (It's sad I can't state my opinion without having to issue that disclaimer!) While we in the West decry the Jewish Holocaust we sit back and watch as other peoples are ethnic cleansed and slaughtered because of their race and/or faith... Fat lot of good "don't forget the Holocaust so it's not repeated" has done for our world. I'm sure that the Bosians and the Rawandans, the Gazans, the Kurds etc etc are all very greatful that we care as much about *their* slaughter as we do about the Jews that were murdered. Six million, ten thousand... numbers don't matter. Holocaust is evil and it does not have a body count quota before it should be considered "bad enough" to be put in the spotlight and kept fresh in our memories! Which comes back to my question: *Why* is the Jewish Holocaust always at the forefront while these other holocausts hardly warrent any mention hardly ever? Including the one taking place right now in Gaza! Does anyone know the body count of dead Gazans? Does anyone even care? And no, I'm not on about "Israel has no right to exist blah blah blah." I'm talking about the children and civilians and the *entire families* in Gaza being openly and freely slaughtered while we sit around wringing our hands about Bishop Williamson's opinions and carrying on about "not forgetting the Holocaust so it's not repeated." Enough with the media frenzy on this matter. We, people, shall refrain from judging the Holy Father and his actions. His intentions were pure and full of christian love for unity. It is quite shameful and dishearting to read statements made by Cardinals, Bishops and priests that openly criticize the Pope. It is time to retrieve and pray. We have a very competent captain stiring the ship through trecherous waters. Let us show him his full support. Thanks for the post. It's clarifying and truthful, unlike most of the commentary on Catholic blogs these days. I feel as though I'm living in Russia! Okay, I don't agree with what Bishop Williamson said, however we should all be able to express our own opinion! Why should we have to believe in everything historians, news reporters etc tell us? What about when Jews deny Christ died on the cross for our sins and the virginity of Mary? Where do we draw the line between Holocaust denial and belief? For example, if I were to say "I believe that 4 to 5 million Jews died in Nazi camps" would that count as Holocaust denial???? I agree with you 100%. Spot on! Will we, I wonder, have global headlines and calls for blood the next time Pope Pius XII is vilified in contradiction of historical fact? Will there be threats of prosecution and imprisonment for any Jew who denies the great friendship Pius showed to that race during its darkest hour, a friendship that his Jewish contemporaries praised him for? I very much doubt it. Yes, Bishop Williamson's remarks were inaccurate, offensive and imprudent. Nevertheless, no one has the right to enforce a different view on Bishop Williamson using threats. This is manifestly unjust. The Catholic way is to show patience, understanding and forgiveness, not to demand "an eye for an eye." The Holocaust, I'm afraid, has become a political tool for certain people. I suggest for balance' sake Catholics should read what Traditional Jews have to say about it. One such source is www.jewsagainstzionism.com. "Bishop Williamson, for an admission to episcopal functions in the Church, will also have to declare, in an absolutely unequivocal and public manner, distance from his positions regarding the Shoah, unknown to the Holy Father in the moment of the remission of the excommunication. ...""
What! Is this annonymous source suggesting that a candidate for episcopal functions in the Catholic Church becomes ineligible because he holds contrary opinions in a matter of history? Is it now a dogma of faith that all candidates for the episcopal ministry in the Church must accept the Holocaust? What utter nonsense this is. Bishop Williamson, strange as his views may be, offensive even, has not sinned against the Catholic Faith because of his denial of the gas chambers. He even stressed that he did not speak from emotion, e.g., race hatred, when he spoke as he did, but rather from conviction. So we Catholics must accept that he did not speak out of Anti-semitic motives. How dare any non-Catholic race, Jews or anyone else, lay down the law to His Holiness on who he will and will not accept into the episcopate. Shame on all Catholics who have gone along with this baying for Bishop Williamson's blood. What is clarifying and truthful Prima? That you are hearing what you want to hear? 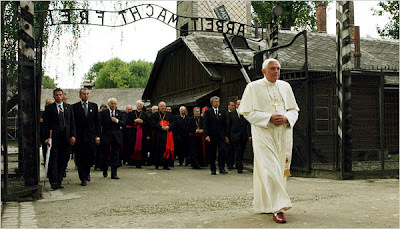 Since when is the Shoah a matter of dogma, a necessity of belief before one is to be called Catholic? It is not required, it is not dogma, and those who persecute a man for an opinion are to be reviled. With all due respect, Father Michael Mary, your true colors are showing. I wish to commend you all for constantly proclaiming the truth without apology and your fidelity to Holy Church. You are truly following in the footsteps of our Holy Father St. Alphonsus. Your example is a source of hope and inspiritation for so many of us who are struggling in this vale of tears. There is no doubt that you are open to the guidance of the Holy Ghost and that the Blessed Virgin Mary, the Stella Maris, is the beacon that guides you. Continue to be a light in the darkness! Thank you - sense at last - I absolutely agree with you. Maybe you should put that post on all the Blogs. What you say is exactly my thoughts. The devil intends to confuse us. He wants liberal Catholics to equate Traditionalism with Holocaust denial. On the other hand, he wants Traditionalists to equate rightful condemnation of the Holocaust with liberalism. Thank you, Fr. Michael Mary, for witnessing to the TRUTH, which will put a stop to the devil's lying mouth. Pray much for the Holy Father. A fact that gets neglected is that there exists a Holocaust denial industry (articles, books, tapes, conferences, etc.) that is just as well organized as the so-called Holocaust industry. Revisionisthistory.org is one example. There are people in Germany and elsewhere who would love nothing better than to finish the job that Hitler started. The purveyors of Holocaust denial (or Holocaust "revision", if you prefer) are aiding and abetting those neo-nazi thugs. 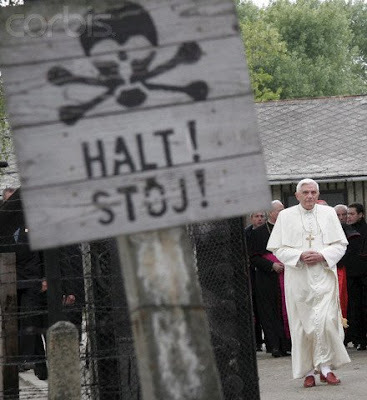 Are there people who exploit the Holocaust in order to subvert the Catholic Church? Of course. Yet we should remember the adage: the enemy of my enemy is not necessarily my friend. You are quite correct about the existence of a Holocaust denial industry. It is tragically true that such an entity exists. Why is it, though, that a majority of the world's population, not to mention the global media, is so very zealous in combating this Holocaust denial while denying a voice to those who condemn the greater Holocaust we know as abortion? And what about the present Holocaust in Gaza? Where is the world's condemnation of this? Where was the world's condemnation of Stalin's slaughter of a conservatively estimated 20 million Christians? Where was their condemnation over the butchery of priests and nuns in 1930s Spain? What about the current persecution of Catholics in Communist China? Why was the majority silent over the persecution of Catholics in Indonesia? Finally, where is the uproar and condemnation of the world over the determined rejection of nations of the Kingship of Our Lord Jesus Christ? So, yes, you are right about the Holocaust deniers, but let us keep matters in perspective and let us not pretend that the Jewish race itself does not have unsavoury elements within it. We love the Jewish race for the sake of Our Lord and for the sake of our shared belief in the Old Testament. We truly desire their conversion to Christ and His Catholic Church and for this reason it is impossible for Catholics to be antisemitic. Nevertheless, let us not pretend against the facts of history, and even Sacred Scripture, that certain members of this race have not, and do not agitate against the Church in general and the Christian order in particular. What is wrong with holocaust denial? Imprudent, offensive, distasteful? Of course, and more. More deeply, Holocaust denial is the first movement in a return to persecution of the Jewish people. Why? Because if there were only 200 – 300, 000 who perished then why are we told there were over 6, 000, 000? This leads to a feeling of being deceived by the Jews, and anger that normally follows the feeling of having been deceived. It rolls on..... Holocaust denial is the beginning of believing in the ‘Judeo-Masonic conspiracy’: a belief, that says that the Jewish people are controlling the world’s economy here and now; This is a belief that fuels hatred. The Bishop’s words are not attacked because they express a mistaken view of history. His words are attacked because the espousal of ‘holocaust denial’ is nothing less than acceptance of the ‘Judeo-Masonic’ conspiracy plot; and it is the means of spreading it this belief to others. Its common expression is found in ‘The Protocols of the Elders of Zion’; when that is digested, a ‘world vision’ may be accepted, or rejected, that makes the Jewish people our enemies, directly responsible for inflation, financial crisis, political manipulation and everything else that goes wrong in the world. They are the bankers, the controllers of governments etc. There is no other reason for ‘Holocaust denial’ than opening up questions that will inevitably lead on to ‘discovering’ mass deception, then the ‘Judeo-Masonic’ conspiracy. Fair enough, I accept your point. So, conversely, I assume you accept mine that no individual Holocaust should be given global importance above the others of history? As a follow up to my last comments, I thought you, and others, may wish to begin your education with the following excerpts from Pius IX's Encyclical Letter, Etsi Multa, of November 1873. I would then suggest a read of the same Pope's Encylcical, Quanta Cura. This is easily found with a simple google search. 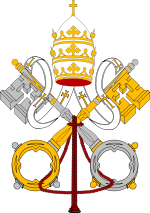 Please remember also that these Encyclical Letters carry infallibility with them. "28. Some of you may perchance wonder that the war against the Catholic Church extends so widely. Indeed each of you knows well the nature, zeal, and intention of sects, whether called Masonic or some other name. When he compares them with the nature, purpose, and amplitude of the conflict waged nearly everywhere against the Church, he cannot doubt but that the present calamity must be attributed to their deceits and machinations for the most part. For from these the synagogue of Satan is formed which draws up its forces, advances its standards, and joins battle against the Church of Christ. 29. Our Predecessors, as watchers in Israel, denounced these forces from the very beginnings to rulers and nations. Against them they have struck out again and again with their condemnations. We Ourselves have not been deficient in Our duty. Would that the Pastors of the Church had more loyalty from those who could have averted such a pernicious plague! But, creeping through sinuous openings, never stinting in toil, deceiving many by clever fraud, it has reached such an outcome that it has burst forth from its hiding places and boasts itself lord and master. Grown immense by a multitude of followers, these nefarious bands think that they have been made masters of their desire and have all but achieved their goal. The have at last achieved what they have so long desired, that is, that in many places they obtained supreme power and won for themselves bulwarks of men and authority. Now they boldly turn to this, to hand over the Church of God to a most harsh servitude, to tear up the supports on which it rests, and to attempt to distort the marks by which it stands out gloriously. What more? They would, if possible, completely wipe it out from the world after they had shaken it with frequent blows, ruined it, and overturned it." Now unless I am greatly mistaken, Pius IX's use of the term "synagogue of Satan", coupled with references in both this document and Quanta Cura to Freemasonry, is this Pope's way of telling Catholics that a Judeo/Masonic plot is in force against the Church as well as the established order. Perhaps Fr. Michael Mary would be good enough to give us his take on this. After repeated ambiguous declarations in the last few weeks about the Holocaust and other issues, several Italian sources report that the Italian District of the Priestly Fraternity of Saint Pius X (FSSPX / SSPX) has announced the expulsion of Father Floriano Abrahamowicz, the priest responsible for Northeast Italy. [Portion of the SSPX NOTE, according to several Italian news agencies:] "The action is in effect from Friday, February 6, and was taken for grave reasons of discipline. Father Floriano Abrahamowicz had expressed for some time positions distinct from the official ones of the Fraternity of Saint Pius X. The decision of the expulsion, though painful, was made necessary to avoid that the image of the Fraternity of Saint Pius X be distorted and, with it, that its work in the service of the Church be damaged."